Got together with a bunch of WSET students for dinner and wine tasting. Venue was Babylon, a new restaurant on Gough Street. Honestly the food was nothing to write home about. While I realize the food was cheap, I was expecting somewhat better spring chicken than what I got. The starter of Boston crab claw salad was also only so-so. Happy to have pumpkin pie for dessert, as it is Halloween after all. We had 11 people with 11 bottles of wine, which was more than plenty. We were blind tasting, and with this crowd anything goes. 2000 Nyetimber Cuvee Classic - an interesting sparkling wine made from all three Champagne varietals in West Sussex, England. Toasty oak, yeast and minerals on the nose, while slightly acidic on the palate. Dom Ruinart Blanc de Blanc NV - a very vibrant wine, crisp but not too acidic - a tad sweet even. Unfortunately the finish was a bit short. 1975 Pichon Lalande - classic Bordeaux nose, with plum and some red fruits left. Very smooth to drink but a bit flat on the palate. 2007 Novy Family Blanc de Noir - a very interesting wine made by the people at Siduri, from Pinot Noir grapes. Lots of tropical fruits like banana and pina colada, with nutty almonds, floral and sweet nose. Really enjoyable and my white wine of the evening. 2004 Domaine de Chevalier Blanc - a classic white from Graves, with very heavy, toasty oak and lots of minerals. It's surprisingly ripe on the palate with good acidity balance. 2000 Siduri Pinot Noir Pisoni Vineyard - really big and powerful sweet nose, a classic Californian Pinot, with a hint of orange rind. 2004 Pauillac - interesting and surprisingly good for the 3rd wine of Chateau Latour. A bit plummy, smoky and sweet, ripe fruit. Not sweet on the palate, however. 2001 Mustuguillo Quincha Corral - a Spanish wine made from Bobal, this was my red wine of the evening. Explosive sweet nose, very jammy with lots of power and oomph! A bit high on the alcohol and could use a bit more aging. 2001 Yarra Yering Dry Red Wine No.1 - very sweet nose with a hint of stewed prunes, grilled meats, smoke and coffee. The nose was a bit sharp but the wine fell a bit flat on the palate. 2004 Camille Giroud Corton Les Chaumes - a typical Burgundy with sweet fruit and black cherries. A bit more alcoholic than I expected. 1988 Hugel Gewurztraminer Selection de Grains Nobles - very floral nose with acetone, orange, pink grapefruit notes. Sweet on the palate but finish was a bit bitter. I'm glad I finally had a chance to open this bottle. We had another MNSC gathering tonight, held at Tuscany by H. I haven't dined here since Harlan Goldstein became the chef here after some shuffling among the group of restaurants that bear his name, but I'm happy to report that the concensus among MNSC members is that the man is back! It was a pretty awesome meal. We started with a plate of antipasto, with a huge chunk of very soft and yummy buffalo mozzarella on top of a slice of tomato, some sweet Italian sausage, and parma ham with melon. Everything was simple yet delicious. Next up was a bowl of pasta with wild boar ragout. This was simply awesome as I love wild boar ragout. Harlan also added little chunks of pancetta to give it added texture, which was a very nice touch. I think most of us inhaled or wolfed down the pasta in no time. We also really enjoyed the ocean trout with hazelnut crust and caramalized onions. It's easy to mistake the trout for salmon due to the appearance and the texture. The trout today was oh-so-tender and melts in your mouth. I finished with a bowl of pistachio and latte gelato. The gelato was light and airy, and worked well with some fruit topping. A perfect way to end the meal. We finally ended the evening almost 4 hours after we began, and I was once again both stuffed and inebriated. Looking forward to another 3 tastings in December! Tonight I met with with a couple of wine lovers, and we had some very interesting wines over a very simple dinner. The venue was Nino's Cozinha, a new Portuguese/Macanese place in Wanchai. We had an al fresco table, which made the experience even more enjoyable. The food was simple yet simply awesome. Bacalau frito com batatas fritas - bacalhau in potato croquette. Very awesome. The thin outer layer is really crispy and fragrant, while the inside is mushy and - amazingly - light. Chouriço assadas - really tender and juicy, with just a bit of spice. Goes very well with the spicy Zinfandel. Camarao assado na panela com alho e cebola - the shrimps have had the shell removed, and sit in a wonderful sauce made of garlic and olive oil. You can smell that garlic from a mile away. Bacalhao a bras - this is one of my favorite dishes, and they do a pretty good job here. Strips of bacalhao fried with red bell peppers, onions and eggs. I could come and just eat multiple portions of this! Rabo de boi guisado - the surprise of the evening. The oxtail is not stewed with red or port wine, so the taste is very light. Lots of carrots, tomatos, celery and herbs. Actually this paired better with white wine compared to the heavy reds we brought. Camarao com pimenta no forno - the shrimp with pepper in claypot was a good way to finish the evening. The claypot came about 4/5 full of white peppercorns, and the shrimps were buried underneath. The shrimps were fresh and sweet. As for the peppercorns, I can tell you that the fragrance was amazing. When the waiter first lifts up the lid for the claypot, the fragrance hits you immediately. I am immediately reminded of the Singaporean bak kut teh (肉骨茶) that I had at Ya Hwa (亞華) last month, because that also had a heavy dose of white pepper. At the end of the evening, I found myself playing with individual peppercorns, holding one between my fingers and just sniffing it, enjoying the perfume. But let us not forget the real reason for getting together - wine! John brought 2 bottles while I contributed one, and three bottles was definitely more than enough for the 3 of us, especially given the high alcohol levels of all three! 2001 Marcel Deiss Mambourg - this is a very interesting wine as it is a blend of all Pinot varietals: Pinot Blanc, Pinot Gris, Pinot Noir, Pinot Beurot and Pinot Meunier. At 13.5% alcohol it tasted spicy and ripe on the palate, and was a bit fizzy on the tongue with a long finish. The nose was initially very muted, belying the complexity of the wine, but showed minerals and a hint of sweetness coming from ripe pears. A very tasty wine, and I'd love to get my hands on some of this. 2000 Turley Zinfandel Hayne Vineyard - the star of the evening, and at 16.7% alcohol packs quite a big punch. The wine was very sweet on the palate, but a bit spicy on the tip of my tongue. Nose was classic Turley sweet red fruits, but with some marmalade and a hint of acetone. 2002 Pax Syrah Alder Springs 'the Terraces' - I double-decanted the wine at home because of my last experience with Pax wines. These wines need lots of time to breathe. Unfortunately the result was that at dinner, the nose of the wine was initially muted without a lot of fruit. There may have even been a hint of TCA. But the nose did eventually come out about 3 1/2 hours after opening, with iron, cotton candy, marmalade and red fruits. The tannins were firm and chewy, and the wine was spicy on the palate. A bit disappointing, but maybe it's just bottle variation. 15.2% alcohol. I was pretty drunk by the end of the evening, and very satisfied with the cuisine as well as the casual atmosphere. I am definitely going back for some yummy Portuguese, and soon! Another day, another decadant lunch while the world around us falls apart. I met up with a few ex-colleagues - our Lunch Club - and once again ended up at Cipriani. Today's mission was simple. It's white truffle season, and I'm there to enjoy the white truffle risotto parmingiano that I had last Thursday. There was no need to order anything else to distract me. The risotto was exceptional. A perfect plate laid out before me, on top of which the waiter proceeded to deposit shavings of white truffle. The risotto was wet and sloppy, while the arborio rice grains were al dente. Of course the perfume of the white truffle made my day, although I really thought that there wasn't enough of it. At HKD 750 a plate - with supposedly 5g of truffles - one can understand my desire to get as much of the white gold as possible. No meal at Cipriani is complete without some fabulous cake. Instead of my usual vanilla cream cake, I chose the zabaglione cake that I haven't had for some time. It was wonderful, with the distinctive taste of egg yolk and Marsala wine from the zabaglione. The bottom of the cake is made from flaky pastry like a mille-feuille, which made it all the better for me. Another satisfying lunch at my favorite Italian restaurant. I'm looking to go back while the truffles are still in season. Today I finally did something that I have wanted to do for a while: bring a nice bottle of red wine to wash down a burger. My partner at work was kind enough to contribute the wine, and the team went to Cafe Causette at the Mandarin Oriental for lunch. The wine - a bottle of 1990 Gruaud Larose - was dropped off at the Mandarin and decanted about 2 hours prior to lunch. While there was a hint of TCA (commonly known as cork-taint) in the nose, the wine drank beautifully. It had the classic St Julien nose, with sweet grass, a bit of green peppers, red fruits and a bit of smoked meats. Surprisingly, the tannins were still pretty firm, while the acidity was a tad high for my palate. It's been some years since I last drank this wine, and I think it remains a beautiful wine. We started with a nice little green salad before the main event. As for the hamburger, I thought it was very well done. The bun was very tasty, not too hard and not too flabby. The beef patty was juicy, but could use a tad more flavoring. It was, however, slightly charred to perfection on the outside, which imparted enough flavors to make it interesting. My mushroom and egg toppings were delicious. I think everyone enjoyed their burgers. I decided to check out the Zachys auction today. I wasn't planning on it at first, but Fritz Hatton from Arietta - who used to work for Christie's - is here as the auctioneer for Zachys, and I received a catalog at lunch on Thursday. I decided to do some homework, and try to see if I could pick up some bargains. What a difference 5 months make! Since the last Acker auction in May, the world has become a different place. Financial markets worldwide have taken some serious battering, and we are still in the midst of the downturn with markets worldwide continue to fall yesterday. I arrived about an hour after the auction started, and while the room was very full - they had to put me in an alcove up front - the mood was immediately apparent. Most lots were going for cheap, with a significant portion selling for at or below the pre-sale estimate. A good number of lots also remained unsold. The victims were blue chip Bordeaux (people already have enough stocks of these) and high-priced lots like 2005 Burgundy or DRC Romanee-Conti. Once the price got past HKD 150,000, people found it increasingly hard to justify bidding for these. While this auction had a few gems which stood out, such as a parcel of ex-domaine Jaboulet, including some of the legendary 1961 Hermitage La Chapelle, there was only one superlot - a 24-vintage vertical of ex-chateau Latour imperials which sold for HKD 1.3MM. The Acker auction in May had multiple lots breaking the HKD 1MM mark, including 2 cases of 1945 Mouton-Rothschild that went to the same buyer. We had to make do with a solitary bottle of this legendary wine which sold for HKD 45,000. Most of my wine geek friends stayed away from the auction, as some of whom were saving their money for the upcoming Acker auction next month. The bidders from mainland China - some of whom attended the Acker auction in May - were also conspicuously absent. As for me, I ended up picking up a couple of cases of white wine at the low end of estimates. Not exactly a screaming bargain, but I made sure that I didn't overpay. And I'm dying to try out a couple of bottles of very old DRC, bought for slightly above low end of estimates but something I just couldn't pass up. FYI Zachys was kind enough to serve some wines during the auction. We started with the 1998 Pol Roger Cuvee Sir Winston Churchill before lunch, which was toasty with a bit of caramel/creme brulee in the nose. Very young but had a nice acidity balance. During lunch we were served 1988 Latour from an imperial, as well as 1997 Jaboulet La Chapelle from double magnums (or was it jeroboam?). The Latour was classic, with mint, cigar smoke, prunes and a bit of brett in the nose. A nice wine to drink with the food. The La Chapelle was a little disappointing, with high levels of acidity and not much of the trademark nose that I have come to love. I guess it needed more time to breathe. Towards the end of the auction, they decided to serve us more wine to try to get things going. The 2000 Talbot was not bad, with mint, grilled meats, smoke and a hint of orange in the nose. It was a little acidic but overall a very pleasant wine to drink. Today I finally met up with B, the kind-hearted big sister who went out of her way to help make my stay in Geneva enjoyable. She had kindly offered to show me around the shores of Lake Geneva, and also made reservation for us at the Michelin 3-star restaurant Philippe Rochat. We find ourselves seated in the corner with good natural light for ease of taking pictures. What ensued was a 4 ½ hour lunch, and one of the best meals I’ve had in recent memory. There were two degustation menus, and after some debate we both decided to go for the same one. I started with a glass of 2007 Chasselas Selection Philippe Rochat, made by Domaine du Daley, at the suggestion of the waiter. It’s a local wine so I thought I’d give it a try. Was not impressed. Perhaps the wine had been open since last night, and it has gone flat. Huîtres noisette Marennes-Oléron à l’osciètre – very nice Fine de Claires oyster. The jelly underneath tasted of brine, just like it would be if the oyster were freshly shucked. I love the white ceramic spoon used to scoop up the caviar. Croquet de foie gras de canard à la gelée de cassis – a really nice creation here. The foie gras is very smooth, and worked really nicely with the thin layer of cassis jelly. The garnish – which includes pistachios and more cassis – adds another dimension to the dish. The warm brioche was very yummy. Soupe thaïe de crabe de Lannion à la citronnelle – an interesting Asian twist. It almost tastes like tom yum kung without the chili, with lemongrass, alfalfa sprouts and black sesame adding the crunch. There are also little raviolis with very small amount of crab filling inside. Teppaniaki de lotte de L’Arcouest tiède bagna cauda – the monkfish has a chewy texture not unlike lobster (hence sometimes referred to as poor man's lobster), and I loved how the sauce and garnish worked so well with it. The interesting thin layer at the bottom is the chef's slightly more solid version of bagna cauda, an Italian dipping sauce. Bouchée de Saint-Jacques d’Erquy au naturel – the scallop enclosed in a thin layer of carrot was deliciously sweet, while the very light emulsion was acidic to taste, with chopped carrots and celery adding texture. Queues de grosses langoustines de Loctudy coraillées au curry vert de Bangkok – the langoustines from Loctudy were wonderful – sweet and tender and garnished with strips of green apples. The green curry was very interesting, with more bits of green apples inside. 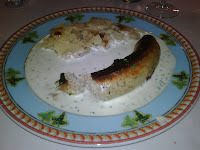 Lièvre à la royale – the gamey hare meat was actually really nicely done, despite the slightly chewy and dry texture. The sauce was heavy and made from blood – exactly how the duck blood caneton tasted like at La Tour d’Argent. A heavy dish but not too overwhelming for me. Sélection de fromages frais et affinés – I tried a bunch of local cheese here, including at least 3 varieties of Gruyère. I didn’t believe B when she told me that Comté is actually the same as Gruyère – the difference being which part of the Jura they come from and the fact that Gruyère is now a Swiss AOC. But after tasting these, I have to admit that the taste is almost identical. The Reblochon is also pretty good. Espoumas de poire Williams aux baies de sureau – delicious and refreshing, with a sprinkle of pistachio bits on top of the foam. Moelleux de chocolat Manjari au café Arabica – the warm-centered chocolate cake using the best ingredients. The café Arabica ice cream is wonderfully intense and aromatic. We shared a half bottle of the 1999 Marc Morey Chassagne-Montrachet 1er Cru Virondot. This turned out to be a wonderful wine. Golden, honey-colored after a few years of aging, the nose was also full of honey, butter, pear Anjou and green apples. You can taste the ripe fruit on the palate, and there was a good acidity balance and a reasonably long finish. Excellent! We were the last table to leave the restaurant, past 4:30pm... It really was a fantastic meal, and I can't thank B enough for everything. Hopefully I will be able to repay her kindness when she and her husband visit Hong Kong next year. Day 3 in Geneva, and once again I'm running late for a meal. My unscheduled meeting ran over a bit, and I rush to meet my friend Nunu for lunch at the Michelin 2-star Restaurant du Parc des Eaux-Vives. The restaurant setting is absolutely gorgeous, on the second floor of the building that sits atop a small knoll. We had a table by the window with views of Lake Geneva and the UN on the northern shore. A cute little bar of lightly-seared tuna, topped with caramelized onions (and ginger? ), and served with two halves of a tiny, grilled mushroom. This is really cute. And yummy, too! I start with the l'oeuf de poule, Ormalingen pig. Ham and pig trotter made from free-range pigs, made into a potato salad with Burgundy black truffles. The egg - in the edible tube - is separated into a semi-hard yolk at the bottom and blended with potato into a foamy liquid at the top. Strips of black truffles make for a wonderful combination. The "L" is a wall made from squares of ham, pig trotter and truffes on top of small potato cubes. Very creative and pretty, although a tad heavy on the salt for my taste. For main course I ordered the deer from the hunt of Jean-Marie, since I don't get to have venison much in Asia. Three pretty noisettes of venison sauteed to perfection - pink on the inside. The thin slices of beets hid a layer of pumpkim mash underneath. Puffy potato chips stuck in individual dollops of pumpkin mash were pretty. Separately, there was also a parmentier crumble in small cup which contained pumpkin, chestnuts and a layer of venison at the bottom. Unfortunately I again found this to be way too salty for my taste. I had a selection of cheese from the trolley, choosing Comte, Epoisses, Appenzeller and some goat cheese. Wonderful stuff, but I'm almost bursting at this point. I think Chef Olivier Samson is a highly creative and skillful chef, and the star rating is probably well-deserved. However as I mentioned earlier, I thought the tastes were a bit of the heavy side. My friend Nunu's choices actually looked even better than my own. She had scallops for starters and there were three plump ones topped with black truffles. For main course there was the line-caught seabass, which looked oh-so-tender and topped with Oscietra caviar and Champagne emulsion. I would suggest diners favor the seafood when they come. For dinner, I wanted something regional that I can't get in Asia. I cross over to the right bank, and find myself in the fortunate position of securing a table at the Bistrot du Boeuf Rouge. This is one of the most popular places in town, and I can see the reason for this popularity. For main course I had something that I had been craving for years - andouillette! This country sausage stuffed with pig tripe is something you just can't find in Asia, and it's been 6 long years since my last sampling. I got it with the mustard sauce. Unfortunately, this wasn't quite what I had in mind. First of all, the sausage was stuffed with a lot more than just tripe, including a lot of spices. The heavy mustard sauce - with Dijon mustard, of course - also got to be a bit too much for me. I should have ordered just the grilled version so I could have mustard on the side. I am reminded of my dinner at the French Laundry. It was also a time when seasons were changing, and I was likewise wearing a sweater in a room that was packed and a bit too warm. There was also the mustard sauce for one of the meat dishes, and the combination of the richness, heat, and the spices took its toll on me. I felt a little ill then, and I was experiencing the same thing here. I struggled to finish the andouillette, trying not to get too much of the mustard sauce on the meat, and leave the delicious scallopped potatoes largely untouched. I did have a nice glass of 2006 Sauvignon Blanc from L et Mermoud, with pleasant nose of green apples, muscat grapes and minerals. Good for a quaffing wine! I pick up my very full stomach and have a nice stroll back to the hotel... taking in the last looks of Lake Geneva in the evening. My second day in Geneva, and the culinary experience continues. I am taken to La Coupole for lunch, which is again conveniently near my hotel. Could this be a Genevois branch of the famous Paris brasserie? 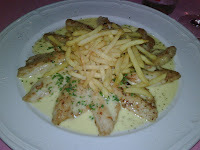 Other than the entrecôte - which I already sampled yesterday - the specialty of the restaurant is fillet de perches leman. Perch caught from Lake Geneva is filletted, pan-fried and served with a lemon cream sauce with chives. In the middle of the plate is a mound of delicious frites. The fish was absolutely delicious, and the manner of serving remind me of sole meunière. Once again I enjoyed the frites and eat more than I should, using them to soak up the sauce. What a great lunch! Once again I finish late for work, and even my original back up plan - trying the McEmmental at McDonald's - failed I got to the door just after they closed at 9pm... So I wander around and find myself in the Cafe du Centre in Place du Molard. I was initially attracted by the prospect of having boudin noir, which happens to be the plat du jour. As I sat down to order, however, I was informed by my waiter that (duh!) plat du jour is only served for lunch. Aaarrrgggh!!!! Oh well. I start with the salade d'automne avec orange et endives. Unfortunately this didn't work for me, because the combination of the bitter endives and radicchio with crunchy walnuts, raisins and orange slices just produced confusion for my taste buds. I leave most of the salad untouched. For main course I picked medallions de magret de canard. The duck breast here is pretty yummy, cut into - what else - medallions and pan-seared just right. Interestingly, the skin and the fat have been scored with a knife before frying. The meat was actually a bit more cooked than the rosé I had ordered, but it was delicious anyway. 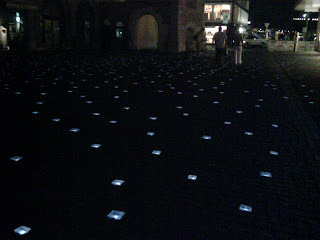 The ground of Place du Molard is interesting, in that many of the cobblestones have been replaced with lights. Printed on the glass are various expressions in various languages of the world, including French, Spanish, English, Russian and even Chinese. Words like "thank you", "goodbye", "cheers"...etc show up randomly around the square. Pretty creative and interesting. I'm in Geneva for a few days on business, exploring the city in my free time and sampling the cuisine at this cosmopolitan city. While I was lucky enough to get reservations at some Michelin-starred restaurants, I was equally excited about the simple, hearty cuisine of the region. My first meal in the city was lunching solo at Le Relais de l'Entrecote, a restaurant only steps from my hotel. This happen to have been rated highly in Zagat's in terms of food, and as I passed by around lunch time, I popped in and got myself a table. This place is ultra busy. Waitresses were dancing around tables like bees pollinating flowers, bringing customers their plates of food. There is only one dish here, and that is steak frites. There is a simple plate of salad, and pieces of baguette to start. Then the main event: a warm plate with half a portion of entrecote - 5 slices or so - is served with loads of thin, crispy frites. The waitress makes sure that you get plenty of the sauce, which tastes like a cross between pesto and green curry. I asked for medium instead of bleu, thinking that in French-speaking Geneva, bleu would be really raw. Well, the meat was pink on the inside, but a tad on the dry side for my taste. Guess I should have tried bleu... Or was it because the meat was so lean, unlike what I am used to at Entrecote in Hong Kong? Anyway. The sauce, as has been written, was delicious. I finish the steak and gobble up most of the large portion of frites. As I was debating whether it was advisable to finish all of the frites, the kind waitress comes over an dumps the other half of the entrecote in my plate. I'm in shock at this point. I was grateful for the small portion of meat when it first arrived, as it would allow me to eat lots of frites without overstuffing myself. Now I realized - quelle horreur! - that the restaurant wasn't skimping on the meat. I was just about full at this point, but couldn't very well toss the meat back. I decide to give it my best shot, and end up taking down another 4 out of 5 slices in the second serving... I am stuffed, on the verge of feeling a little sick from the large amount of rich food. But I'm happy. This simple and delicious lunch is just what I wanted. I blew off my friend Nunu for dinner that evening, as work took a lot longer than I expected. We gave up our restaurant reservation and she stayed home with the kids. Past 10pm, I am left with relatively few choices for dining venues. Nunu suggest that I look around rue de Pâquis - the colorful red-light district where there would be interesting choices of ethnic food. I make my way on foot to the neighborhood, and pass by a number of Turkish joints selling doner kebabs as well as some Chinese places. In the end I settled on Auberge de Savièse, a Swiss restaurant mentioned in the outdated copy of Lonely Planet that I borrowed from a friend. I'm in Switzerland, so what else should I order but raclette? I start with a simple green salad, then proceed to enjoy two portions of the melted cheese. I was very tempted to have more cheese, but I was getting very tired and decided not to stuff myself at such a late hour. Satisfied with myself for having enjoyed the local specialty, I make my way back to the hotel and call it a night. Tonight I attended a tasting dinner for the wines of Selbach-Oster, hosted by Rare & Fine Wines and Montrose Wines, the supplier for the wines. The venue was Chiuchow Garden (潮庭), and I must say that I thought the food was very good, as was the pairing of the wines with the food. 2007 Piersporter Michelsberg - mildly sweet on the palate, with some minerals in the nose. 2007 Zeltinger Himmelreich Riesling Kabinett halbtrocken - slightly sweet nose, with minerals, green apple notes. Pretty dry on the palate. 2006 Riesling Kabinett "fish" - this was a real interesting wine, which is a blend of different vineyards rather than the typical single-vineyard offering. Really powerful nose of petrol, lemon citrus, glycerin and urethane plastic. A full-bodied wine which tastes a bit "oily". 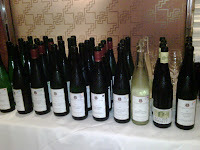 2006 Weissburgunder Kabinett trocken - made from Pinot Blanc, pretty dry with a touch of sweetness on the after palate. Ripeness was evident on the palate and in the nose, with minerals and a bit of spice. 2007 Zeltinger Sonnenuhr Riesling Spätlese trocken - made from ungrafted vines that are over 60 years' old. Steely minerals and osmanthus floral notes, with sweetness on the nose but not on the palate, and a ripe after palate. A complex and rich wine. 2007 Zeltnger Schlossberg Riesling Kabinett - powerful nose of minerals and flint, glycerin. Sweet on the palate with a finish of decent length. 2007 Bernkasteler Badstube Riesling Spätlese - a bit of plastic and minerals in the nose. Nice, smooth and sweet on the palate. Braised Brisket with Red Wine Sauce (富貴牛腩) - nothing really special here. 1999 Wehlener Sonnenuhr Riesling Auslese - this has to be the wine of the evening. An explosion of minerals and petrol, with a bit of rich butter and plastic. Very rich and smooth on the palate, with orange marmalade on the after palate. This is actually only medium sweet for an aisles. 2007 Graacher Domprobst Riesling Spätlese halbtrocken - nose of minerals, green apple and a bit of honey. Slightly sweet on the palate. 2007 Zeltinger Schlossberg Riesling trocken - muted nose with some minerals, a bit of almond marzipan. Very dry on the palate. 2006 Bernkasteler Badstube Riesling Auslese* - the wine that Mr. Selbach claims has a lot of aging potential. Nose of honey, minerals and even a touch of white pepper. The wine is already very sweet here, much more so than the 1999 tasted earlier, but right now it is far less complex. Hopefully this will develop after some aging. Tonight I got together with a few friends at Schurrbart, a German pub in Lan Kwai Fong. It's been a while since I had a taste of German food, so I was happy with my German friend's suggestion for some of his comfort food. German food is pretty hearty, so I dispensed with starters and went straight for the schweinshaxe - the famed roasted pork knuckle. It's been a long time since I last enjoyed this dish, and I was not disappointed. The meat was roasted so it was dry and crispy on the outside, while still retaining some moisture inside. The crispy, slightly hard skin was superb - crunchy in the mouth but worked perfectly with the soft layer of fat just underneath the skin. There is very little to complain about here. I didn't touch the big blob of mash on my plate, but did enjoy the sauerkraut very much. The 2006 Selbach-Oster Wehlener Sonnenuhr Riesling Spatlese was delicious, showing a big nose of petrol, minerals and sweet honey. It was slightly sweeter on the palate than I expected, and the girls definitely liked this wine. I didn't have room for dessert, so I opted for a couple of schnapps - starting with winter spiced apple as a substitute for apple strudel. This wasn't a bad choice, and did actually taste like the strudel fillings . The blood orange that followed was also pretty nice, although the higher level of alcohol here was clearly detectable. It wasn't exactly fine dining, but I really enjoyed my evening. I've always liked Misia, and I was always impressed with her voice and vocal range. I haven't followed her career lately, so it was interesting to see if her style has changed over time. I think Misia generally has three types of songs in her repertoire - the slow love ballads, which is her trademark and loved by her fans; then there are songs with slightly faster beat, making them a little easier to dance to; finally there are the energetic, pure discotheque songs. Since the tour is called "Discotheque Asia", she started with some of those energetic numbers, and made good use of pyrotechnics. Towards the end of the show, lasers were used to get the crowd going. However, I must say that these aren't the best songs for a live show. The loud, kicking bass do a good job of drowning out Misia's voice, which is a real shame. I do love Misia's love ballads, especially "Everything", one of the early songs that made her famous. I'm really happy that she performed a great rendition tonight. Overall, it was a pretty good show that lasted 2 hours. 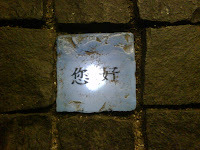 I'm hoping that Misia will return to Hong Kong soon. I just came back from a few days in Singapore, where I had my first experience with F1. I'm glad I finally got the chance to go see F1 live, as I had missed two previous opportunities to do so. Funnily enough, those two chances were both in the same year - 2004. I missed the chance to go to Sepang with clients, as it was both the day of my housewarming party as well as the day of Taiwanese presidential elections. Later that year I missed the chance to go to the first Shanghai F1 - again on a free ticket - because I flew back to Singapore to pack up my household items for the move to Hong Kong. Anyway. I had picked the seat that was right on the left edge of the Esplanade Waterfront Grandstand. I thought that I would have an unobstructed view of the cars coming toward me on Turn 16, plus a good view of the cars speeding away from me on Turn 17. It took me a while of being on the internet plus calling the ticketing office to get the seat I wanted. When I walked around the track on Friday afternoon, I was horrified to find out that I couldn't see Turn 16 clearly. There was a steel structure that was part of the Esplanade that was in my way, and a tree next to it! So my strategy completely failed. So I decided to roam around looking for good shooting locations. During the final practice session on Saturday, I stood on the stairs at the right edge of the Esplanade Waterfront Grandstand. This gave me a view of the cars coming into Turn 17, and speeding away in front of the Bay Grandstand and into Turn 18. I decided to put my 300mm f/2.8 on the monopod and practice my panning as the cars came by. Got some decent shots. For the qualifying, I moved to the stairs at the left edge of the Bay Grandstand. This gave me a reasonable view of the cars coming into Turn 18 as they passed below the grandstand. I decided not to pan but simply freeze the action with a fast shutter speed. I was definitely at the right place at the right time. Near the end of qualifying on Saturday, Alonso's engine failed and he came sputtering down the stretch, stopping right in front of where I stood. He got out of his car and held is head in his hands, as realization took over that he would be nowhere near the top for this race. In my rush to take pictures, I had unfortunately forgotten that I was on manual exposure, so most of my pictures didn't quite come out. Otherwise these would have been really priceless shots. For the finals on Sunday, I went back to the right edge of the Esplanade Waterfront Grandstand. Once again this proved to be a great spot. Nelson Piquet's Renault spun out of control and crashed against the Bay Grandstand. I had a direct view of this, and added my 2X extender to get some close shots. For some reason, a few drivers just can't seem to get control of their cars and insist on going straight past Turn 18. Later we would see Toyota's Timo Glock crash into Turn 18 and end his race here. There was of course more drama elsewhere on the track. It just wasn't Ferrari's day (or night, actually). Who could ever forget the sight of Massa's Ferrari speeding off with the fuel hose still attached to his car? And the Ferrari pit crew chasing after the car, removing the hose and carrying it back to their station? I was laughing my head off when this happened, and wished that I had taken the hospitality package because I'd be sitting right in front of the Ferrari pit! Then with about 3 laps to go, Raikkonen lost control and crashed out. No points for Ferrari. So who won the first Singapore GP in the end? No one would have guessed that it was going to be Alonso, not even himself. For someone starting at the back of the grid to win the race, it was simply unbelievable. But it happened, and I'm sure ING and Renault threw one hell of a party afterwards.